Updated: 4th July 2012; This restaurant had closed according to Urbanspoon.com. The response was beyond everyone’s expectation. 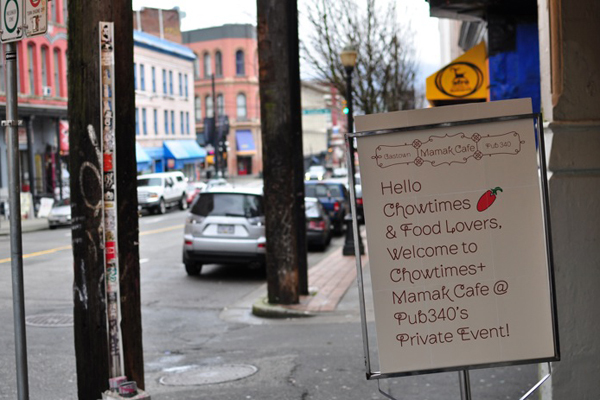 When we put up an event for chowtimes readers, we thought it would be great if we could get 20 people to attend so that we can fill up the small dining area in Mamak Cafe. The response trickled in hour after hour and when we surpassed 20 people I sent an email to Charles asking him if I should stop accepting more. He wrote back saying “the more the better, the entire place can take 120 people”. Charles is the man behind Mamak Cafe. 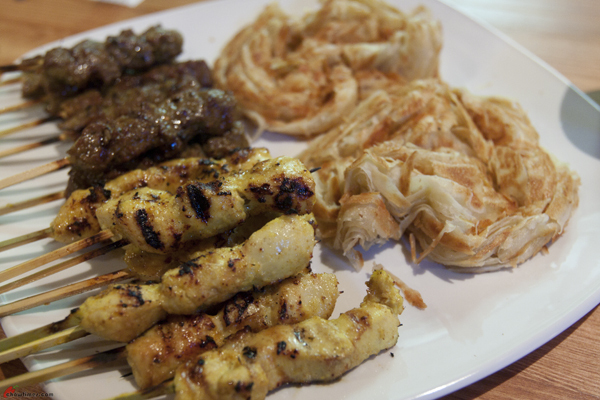 He opened this new Malaysian eatery in Gastown and ran it with his wife, Julie. 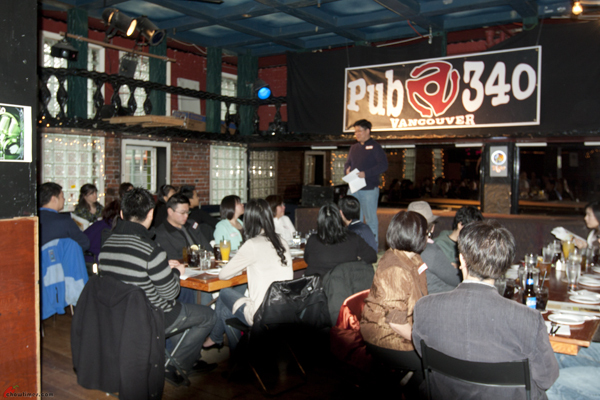 They were the same people who used to operate another Malaysian restaurant called Jonker Street in Yaletown. Since Charles were confident, Suanne and I went on accepting requests. We began to get concern when the numbers went past 30. I wrote to Charles again and this time no response. I guess he was busy and not an email kind of person. I was concerned because the Mamak cafe is not a very big operation and I was worried that they may not be able to handle such a large group. 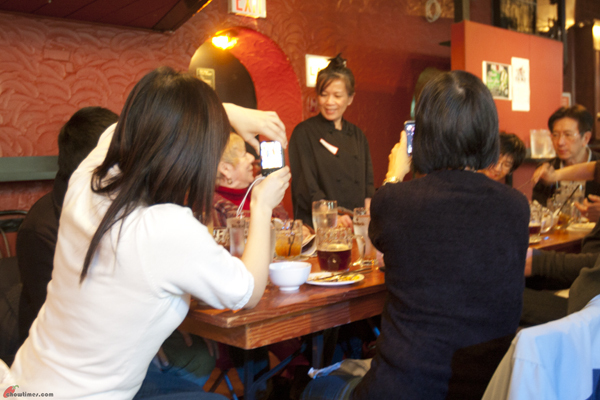 We had organized an event in a small ramen place with 25 people before and it was quite chaotic when the kitchen was not able to handle the group fast enough and the quality of food suffered. When the count passed 40, we desperately needed Charles to respond. He was not aware that we are reaching 50 requests and that is when Charles said we better stop at 50. Even though we posted the message that registration closed on chowtimes, at the end we had over 70 requests which we had to put some on standby. We realized that this is not a simple event even with a dozen people. So, Suanne and I went a week before to meet Charles and his team of volunteers to sort out the logistics, the menu, the program. It became a full fledged project – I was not expecting that! The sign was needed actually and Ada had the hindsight to make it on her own. You see, Mamak Cafe is located in a place that you would least expect to find a Malaysian restaurant. 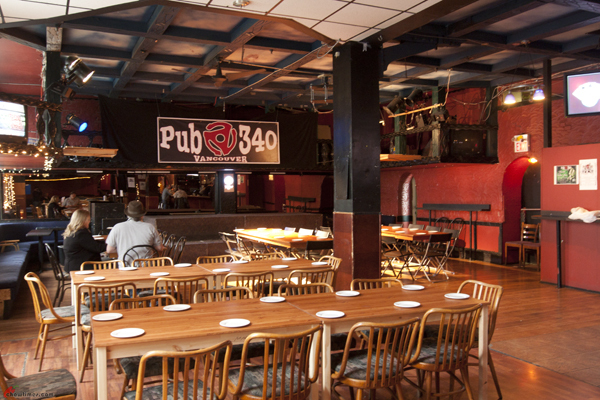 Mamak Cafe is located inside a pub called Pub 340. The week prior to the event, Charles were still deciding how to setup the dining area. Because of the large number of people, Charles had no choice but to take over part of the pub for the event. There was also the issue of having enough tables and chairs conducive for a sit down meal. I was worried (I worry about everything!) but Charles was cool. When I showed up early on the day of the event, the place was all set. I was quite pleased with it considering that this is actually a pub. Needless to say, Charles and Julie was super busy that morning. He was the main man whipping up all the food for 50 people. And it is no joke too that each of the menu items are individually and laboriously prepared. That included flipping the roti canai dough above, grilling the satays, boiling the bak kut teh, cooking the rendang, simmering the curry chicken, preparing the acar, making the prawns sambal, steaming the coconut rice, frying the mee goreng, and pulling the teh tarik. It is not easy especially he had to do that for 50 people. Charles was handling it very well under pressure. I popped into the kitchen once and see if I could help but seeing the kitchen hard at work, I thought I better stay out and let the man do his thing. Ada even prepared a nice write-up of the event and the dishes of the courses of the event. I expected something word-processed and printed off a laser printer. My jaws dropped when I saw the output … fully desktop published and printed in full color. Yeah … next time chowtimes have an event, I am going to see if I could get Ada to do this sort of stuff for me. LOL! 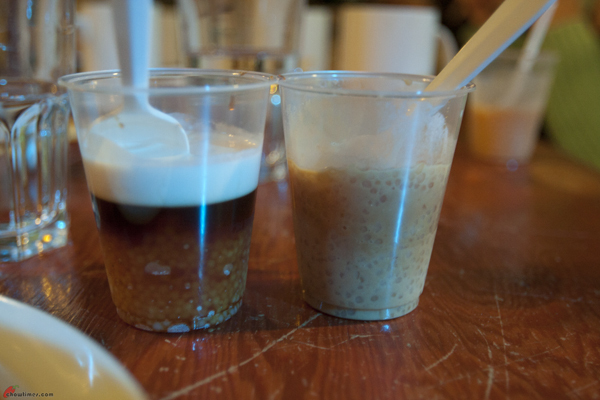 And the $12 also included a choice of beer or teh tarik. It was so generous of Charles and Julie! The event started with a few words from yours truly. Wow, actually people were paying attention to what I had to say. LOL! I hate doing this but … sigh … I gotta do it. It was expected of me I guess. Like what we say in Manglish, I was “damn bloody nervous”. Act 1 started with Roti Canai. It was accompanied with some curry. I had tasted Charles’ roti canai the week before and I must say it was much more flakier the week before. That was top notch but this one is just good. I know … this is made for 50 people among all the other food that Charles had to prepared. The above was the roti (and satays) that I had in Mamak Cafe the week prior. Look at how flakey it is … and not too oily too. I thought Charles did one of the better roti canai in town. 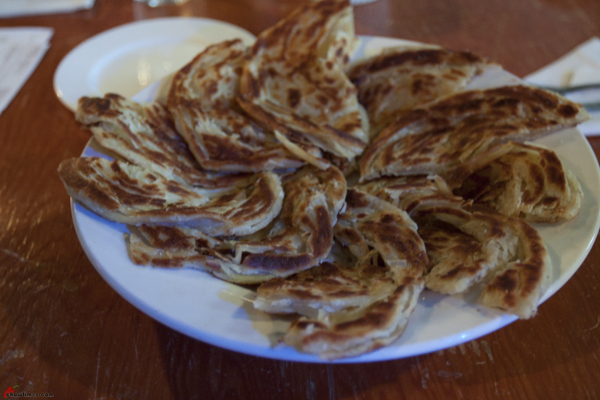 Oh … BTW … roti canai is not pronounced as roti “car-nai”. It is pronounced as “char-nai” as in Chennai in India. 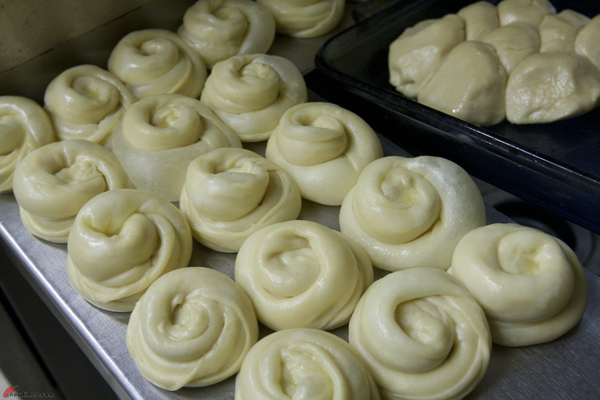 The roti canai is an Indian Muslim food and the influence of this food is really from India. Well, just so you know … while we in Vancouver go seek out roti canai like it is gourmet or exotic food, hehehe … in Malaysia, this is really cheap food. So, say if you are a student in Vancouver and you don’t have money to buy food, what do you eat? You will probably eat instant noodles. Well, in Malaysia, when a student don’t have money to buy food, they eat roti canai. LOL! I don’t know how much it costs nowadays in Malaysian these days but when I was young it was like 20 Canadian cents only. You know, in Malaysia roti canai has different types. In Vancouver it is plain ones but in Malaysia you can get it filled with banana, egg, onions, sardines, margarine, kaya, cheese, Milo (!!!) … the possibilities are endless. The chicken satay was good. It is made with dark meat as it is meant to be. Oh, I hate it when they use white meat for satay. What is missing is some skin but I guess that is too extreme for some people. I like the charring on the sides. Yeah, chicken satay must not be evenly grilled because it will look like it is manufactured ones. This one is juicy. The peanut sauce (not pictured) are good … it has chunky peanuts and not like one of those blender blended nonsense you see in some local Malaysian restaurants. Truth is I never quite like beef satay. 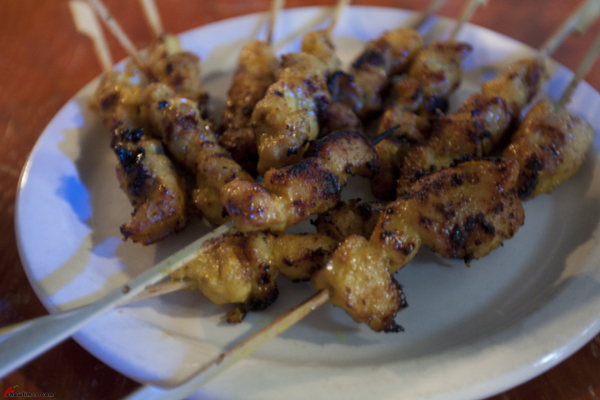 For satay, the best meat is always chicken. Beef is a tougher meat. Act 2 is Bah Kut Teh. 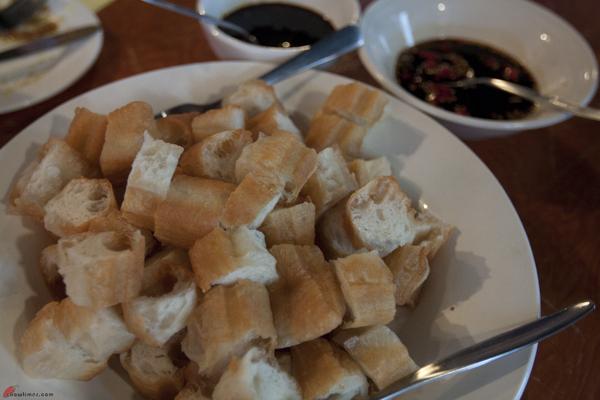 I was always teasing Suanne asking her to start the first Bah Kut Teh restaurant in Vancouver? Do you guys think it will fly with the health conscious Vancouverites? I remember telling Charles to just make it the way it is supposed to be. Forget about trying to make it super lean to suit people. Make it the way a true Malaysian would like it … with the best part of the meat fatty and juicy. Charles did just exactly that. I had a great time eating this. There are many types of BKT. It ranges from the clear brothy ones to the sticky thick ones. Charles’ style was “right of center” with a slight lean towards the sticky thick soup. Charles said that he had to cook this over night and it did the trick … the fatty meat virtually melt in your mouth. This is a dish you must never tell your doctor about. Charles and I debated about serving rice with the BKT. After all, everyone has BKT with rice. Charles decided not serving rice because there will also be rice at the end of the meal and it will be too much. So he ended up serving Chinese donut with this. It is amazing seeing how food brings people together. I see that people were immediately chatting with one another like they knew each other for years already. This is one of the reasons why I enjoy spending time putting together events like this. A lot of people are truly passionate about food and it shows. The Mee Goreng is the only dish in Act 3. 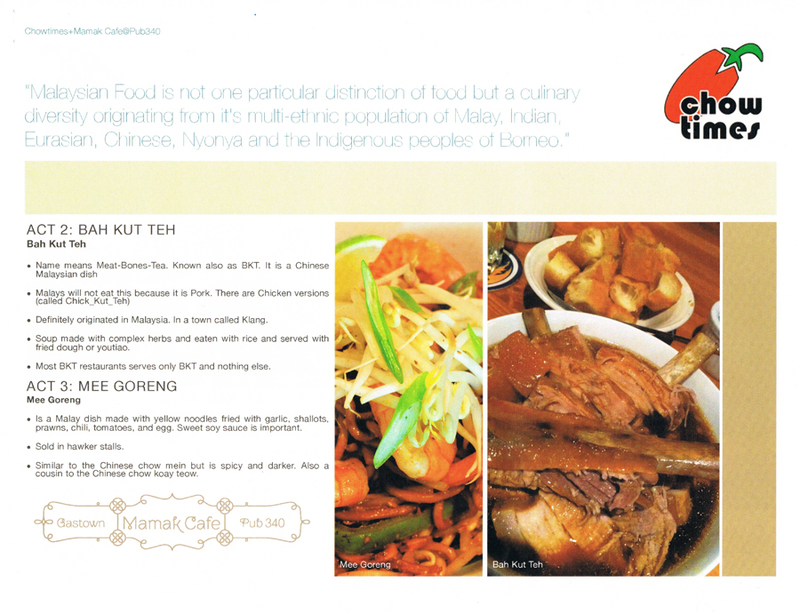 What I like with the menu that Charles put together is how he try to infuse all three sub-cuisines in Malaysia. Malaysia is made up of about 65% Malays, 25% Chinese and 10% Indians. From the Indian side, we had the roti canai. 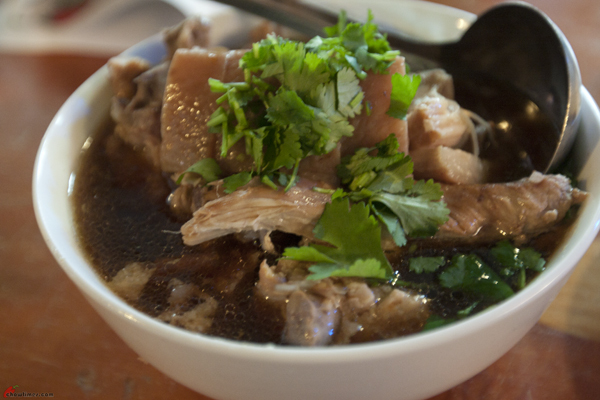 The Bah Kut Teh is definitely Chinese (it has pork!). 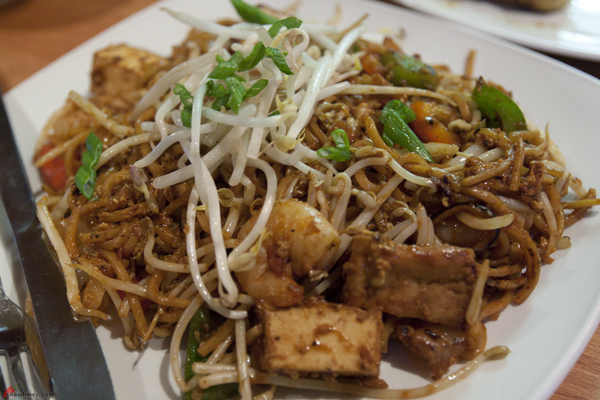 The Mee Goreng is the Malay rendition of the Chinese Char Koay Teow and yet different from it. It is made with yellow noodles fried with garlic, shallots, prawns, chili, tomatoes and eggs. The sweet soy sauce is important. By the time we got to Act 4, I couldn’t eat anymore. And this is supposed to be the main course of the day. Collectively, this is called Nasi Kandar. This is very much an Indian Muslim food and is sold in mamak stalls right up to nice fancy restaurants. The island of Penang is where they serve the best Nasi Kandar. 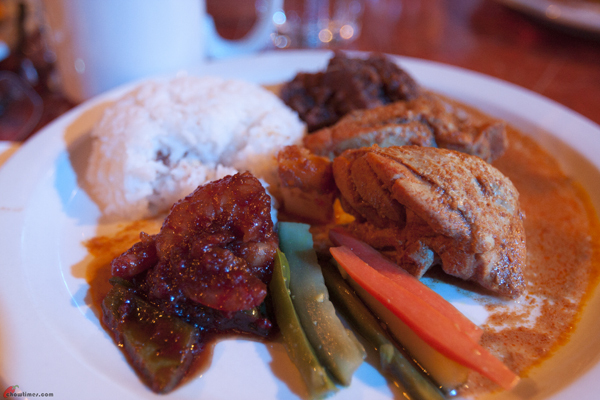 The coconut rice is accompanied by beef rendang, curry chicken, prawn sambal and acar. It is delightful and has a complex taste coming from each of the items. I like the beef rendang in particular as it is one of the more authentic ones I had tasted. I was quite concerned about this particularly because I was discussing this dish from Mamak Cafe with someone earlier and the feedback was far from positive. But it was really good in the event. I guess maybe taste is relative and people expects different taste from others. The event was a bit marred because two of the attendees had their chicken partially uncooked. It was so unfortunate and Charles felt so bad about it. It was alright on my plate and it was quite good. Charles knew it was not excuse. Julie played the gracious host. She went around the tables explaining the dishes to the attendees. And that is Charles above. He is quite a story teller. When I met him the week earlier, he had so many tales to share. So he shared a bit of his background with everyone at the end of the event. It was a fantastic event. When Ada was putting up the schedule, she predicted that it will end after four hours. I thought it would take 1.5 hours or at best 2 hours. I was wrong. Ada was right. It was 3.5 hours when the event ended. Wow, it was that long and people stayed because they had a good time. It was not just the food. It is the newly made friends that made the event so enjoyable. I had a great time personally. I went round chatting with everyone but with so many people, the faces and names went swoosh – sorry about that all! We had a little draw at the end of the event. Charles gave away a few coupons for more of his good stuff. 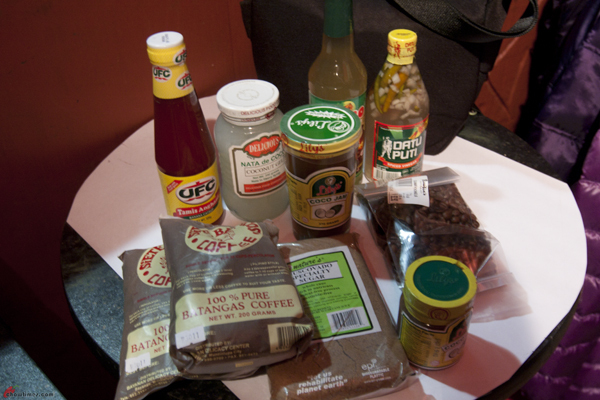 Rey brought a lot of goodies back from the Philippines that he wanted to share with everyone. Rey is such pal and a supporter of chowtimes. So it was a bit of fun and excitement giving those away. Charles made some dessert. It was something he added in the last minute. I can’t remember what it is called. So, thanks a lot for those of you who took time to show up in the event. I hope you enjoyed it as much as I did. All these is made possible because of Charles and Julie (and Ada too) … people with a big heart. 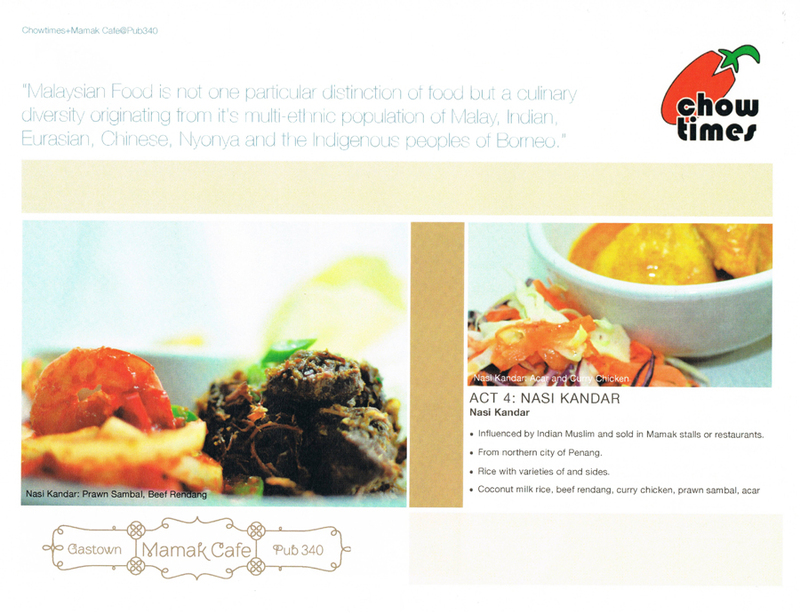 If anyone of you do go and try the food in Mamak Cafe, do make it a point to talk to Charles and Julie. They are very approachable and if you go in their non too busy times, Charles may even share a tale of two with you. Just make sure you have the time to listen. LOL! I am not just saying this because Mamak Cafe hosted this event but I like Mamak Cafe for its Malaysian food. It is not just me. 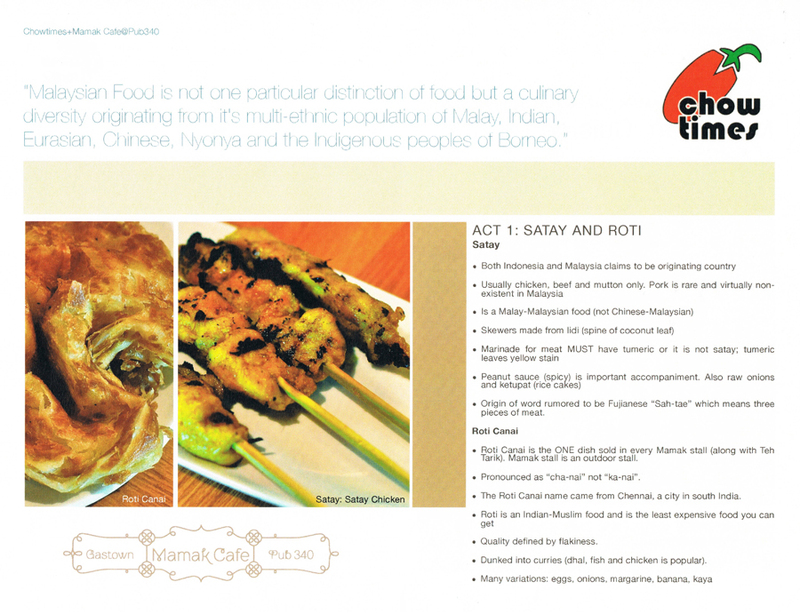 Check out the reviews of Mamak Cafe elsewhere (Urbanspoon, Dinehere, Chowhound) for a complete picture. Personally, I feel that the one factor that does not quite work for Mamak Cafe is the location. I have nothing against pub at all but a pub is just not a place where most people would go looking for Malaysian food. 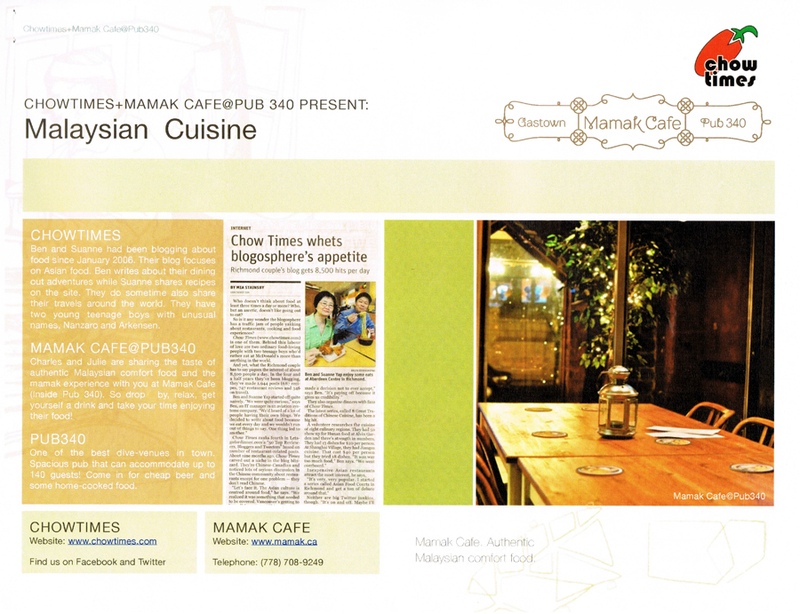 Go and check out Mamak Cafe if you like Malaysian food and give them your support. The cafe is slightly far from work for lunch, but the photos here make me want to solve that! I drove by tonight and noticed that Fresh Bowl was opening up next door to Meat and Bread…which means it will also be next door to Mamak. Coincidence? nasi kandar is prob the one i miss the most. i appreciate charles effort to promote and create more intesrest in malaysian food. i really do! I believe even charles would agree that the version at Mamak’s is not an ‘authentic’ nasi kandar experience. Just for clarification, i think u mention and iirc they serve it with coconut rice. while there are option of rice to serve nasi kandar coconut rice is not the norm. nasi kandar most often served with plain white rice, veg, papadum, your choice(s) of protein and choices of different curries that gives it a unique taste. the stalls i visit will have a secret blend of curry, spiced, curry, gravy, oil that i drizzle on top of the rice which is unambiguously a spice heaven. The mixture of spices and variety makes nasi kandar an often imitated but never well executed destination. Hence it all comes down to only a handful of proper nasi kandar destination in the world. FWIW, Charles and I tried Bo’s laksa together. I would say their laksa are different. Charles laksa broth are more along the lines of a malaysian chinese hawker stall curry laksa. 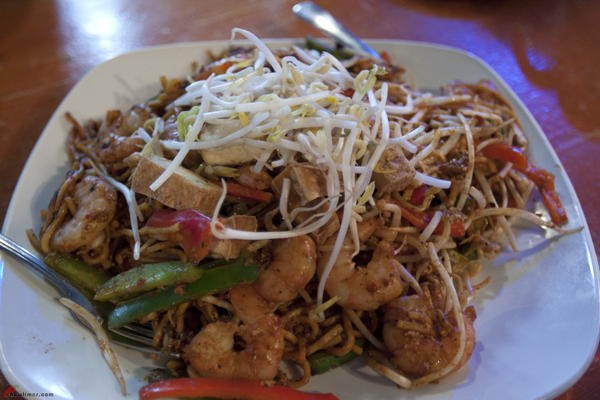 And Bo’s is more abundantly full of flavors with thai influences. Bo’s is indeed unique. I love to try the BKT here. maybe next time i can join. I work so close and never knew of mamak cafe! I wanted to go, but already had plans that time. Laksa hotpot..hmm it sure sounds interesting. Let us know how it goes and keep us posted if you are planning to do another event..
haha…thanks for the correction. Looking forward to what you find! BR and I are laska virgins, (can you imagine!) maybe uncle Ben could be our guide one of these days? I went again this past Friday with a friend and thought I’d tell you about it! My friend and I had the roti cani to share and it was a lot flakier like you said! It was a bit on the oilier side and it was hard to share between the two of us… but I still enjoyed it nonetheless. We also got the chicken satay and I thought it was better done than last time. 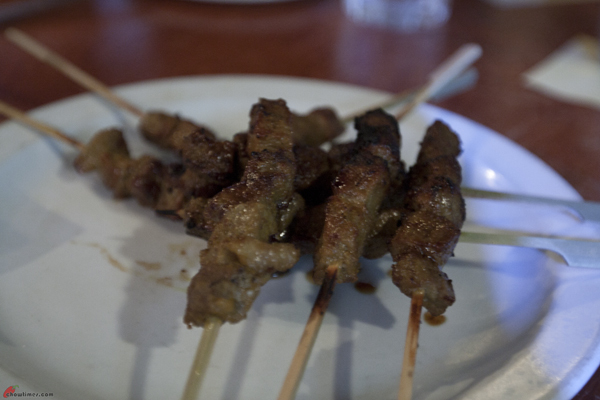 The skewer that I got was a little dry … maybe it was slightly overcooked? But the second time I had it it was gooood. My friend got the laksa and he said that it is different from other laksas he’s had but it was still good. I got a taste of it and I thought it was better than Bo’s (haha I’m still weary about going back and trying it again…) because it was not as oily and spicy. I mean there was still a considerable amount of oil but definitely less than I had at Bo’s. I got the Sambal Udang (the shrimp sambal)and I LOVED it. I don’t know if it’s because I actually got a whole plate of it this time but I enjoyed it so much more than at the event. I thought the prawns were cooked perfectly and there was just enough sauce for the rice. I loved it so much that I was craving it again at the end of the day and I’m salivating just typing this up. Anyways! 🙂 that’s all. Thanks for introducing this place to me and organizing that event! 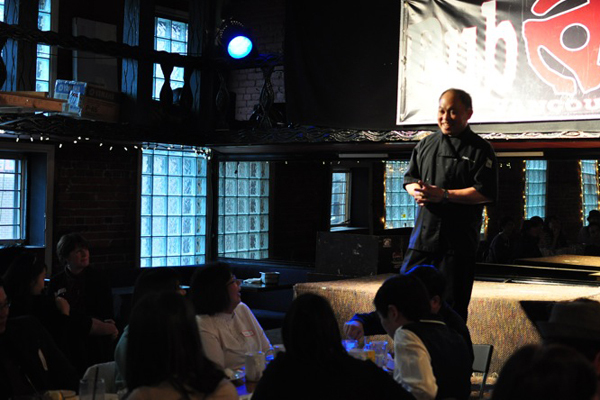 It was nice to meet new people and share the knowledge of food we all bring to the table…literally. He knew because I used my one free appie coupon :b And he did come out to greet us and thank us for coming back! Good guy. Now really sad I missed out on this event because of work. Really looking forward to the next 8GTCC event and would love to join in the exploration of the CRA dishes as well…:-). Wow, 3.5 hours for the entire lunch. That’s even longer than the 8GTCC Cantonese dinner we had. I sure wish I was able to make this one ! I won’t be checking Mamak Cafe out because I hardly go downtown. I’m kinda disappointed because secretly I feel that when a restaurant has the word Mamak, I immediately think of those indian-muslim mamak stalls and I choosing chicken briyani with sauces from chicken, beef and fish curries added, a fried omelette and a couple of boiled kacang bendi (lady fingers). Not BKT. I appreciate Mamak Cafe trying to infuse the popular malaysian foods in their menu but I just want something to be true to their name. This is what a mamak menu should be. I LOVE Malaysian food! I think I might actually check this place out today. The mee goreng looks delicious! I’m not usually one for Malaysian food but these pictures have changed my mind. Hope you can plan another event, Ben (that I don’t bail..)! I never seem to hear about these events until afterward when you write the review. Is there a place you post upcoming events or something? For smaller events (like less than 10), I’ll just mention it in the post and people who are interested in attending will just email Suanne and I. Hope to meet you one of these days. I have nothing planned at this time except for a few people who had expressed interest in joining Suanne and I in discovering the CRA 2011 dishes. These are just small dinners and I don’t consider that an event. Thanks Ben. I’ll keep my eyes open. Ben – I was personally hoping to see a 8GTCC Shandong dinner. IIRC that desginated host (a foodie we know and respect around here) already had a resto picked out(?). Any plans to resume 8GTCC in 2011 ? Ai-ya LR!!! Thank you for the nominations…but…no!!! Not me…I am not knowledge enough for fujian food…and sorry…I am more a 4GTCC person rather than a 8GTCC person. My purpose in life is to eat eat eat…hahahahaha! Hey BG, Taiwanese and Fujian cuisines are so similar. And you seem to be such an expert on Taiwanese cuisine ………. Hehehe! Well, I think a lot of people from Taiwan will know about their Taiwan food and what they expect…it’s kinda like Ben and Suanne has higher standard for Malaysian food. **hiding** from Ben and LR! LOL! Thanks for the shout out but again, gonna gently decline for now…I am lazy…I just want to eat…hahaha! Capital idea! I had actually invited Buddha Girl to be part of the team ( see this post: http://www.foodforbuddha.com/2010/08/2010-08-25-dinner-shanghai-village.html#comments ) but she declined. Go read the interesting post. Anyway, Buddha Girl has to get over the claim that 8GTCC has never been proven to exist per her post. According to BG, only 4GTCC is proven to exists. 🙂 But my offer still stands BG … come on, you know a lot about Chinese cuisine way more than us. You should rethink it! Oh BTW, BG, what is the 4GTCC? Maybe we have one that we had not done before. But for 8GTCC Fujian, I really want to respect Grayelf as she had already “choooped” the cuisine. Let’s see if she is cool with Buddha Girl handle it. As for 8GTCC Shandong, OK OK OK … am gonna get off my lazy bum. LOL! Anyway, the resto picked is struggling and we were kind of unsure. They changed the name, was closed by the coastal health and the restaurant is empty all the time. Let me chat with Keev and see what’s the best way forward. Ooops, sorry to Grayelf, I forgot she was assigned/chosen to do Fujian. Maybe they can collaborate (if GE wants to) like Joe and I. Thanks LR for responding to Ben Q for me…saved me the time! Hehehe! I am so lazy! Hahaha, I obviously got the wrong term when I was googling the Chinese equivalent of “rapper” ! Thank you so much for organizing such a wonderful event and including me in the planning and designing process. It’s really an honor to meet you and Suanne in person(such lovely couple)! I look forward to attending other Chowtimes event; like I mentioned before, drop me a line if you need someone to help with planning/graphics your next Chowtimes event! See you soon & happy eating:)! Hi Ben! We already had something planned for that weekend in advance so we missed the chance! Thank you. Yes! Please invite Buddha boy when you come back from your trip! 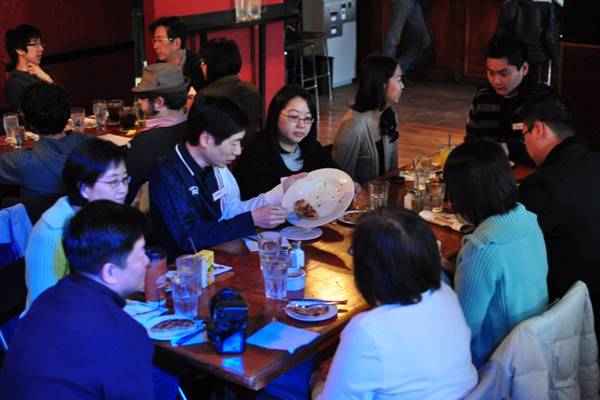 As for BKT, they don’t have it on the menu…but I can ask and see if Charles and Julie can do a BKT event if we have enough people(If we have 15-20 ppl interested)? Anyone interested?